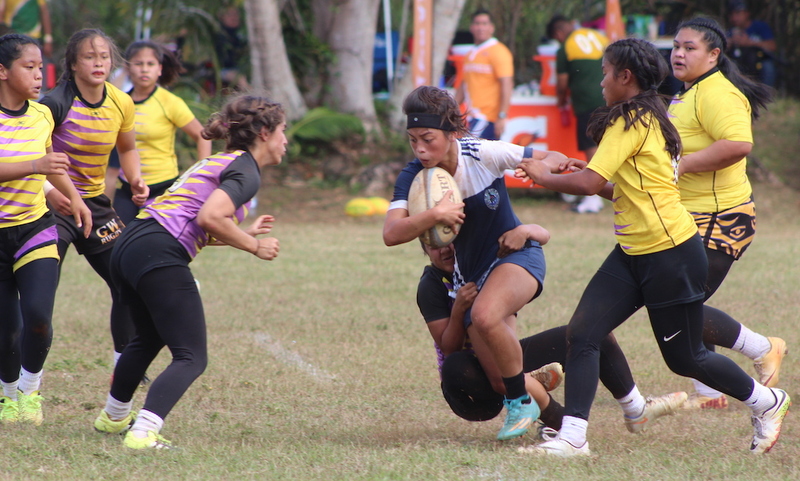 For just the second time in six and a half years, the GW Geckos have lost a rugby match. During Saturday’s host of games at the Wettengale Field, the Academy Cougars stunned the six-time defending champs with a 10-5 victory in the afternoon game. The Geckos got on the board first with a try from Jacilyn Root within the first three minutes of the game for a 5-0 lead, but the Cougars stayed vigilant. Ada struck the Cougars first score after winning the ball off a scrum just a few yards away from the try line. Both teams missed their kicks after try, leaving the score knotted at five points each. Academy took advantage of their opportunities after smooth passing opened up a hole on the Gecko left side. After a tackle, Cougar Hanna Rojas scooped up a free ball and managed to fight her way past they try line for the 10-5 lead after another missed punt after. Gecko star Jalana Garcia nearly broke free for a game-tying, and possible lead changing, try but the Cougar defense managed to drag Garcia down for a game-saving tackle at midfield. “We made sure that we had someone marked on [Jalana] at all times. We did our best to disrupted their offense since we’re a defensive minded team,” added Ada. With the girls games being as short as they are, teams are going to get to face each other at least four times before the playoffs. Cougar coach TJ Ada didn’t allow the girls to celebrate their victory too much, reiterating to his team that their win Saturday was only counted as a regular season win.